Short Description: Improve safety for drivers and bikers by moving bike lanes to be between street parking spots and the sidewalk, reducing car-bike interactions and potential collisions. Long Description: Moving existing bike lanes to the stationary side of parked cars has been implemented in many cities and countries, including New York City, Portland, and throughout Scandinavia. In fact, Cambridge has successfully piloted this idea on Ames Street in Kendall (see photo A below). A current issue is that cars, unfamiliar with the striping, park in the bicycle lane. The Cambridge Traffic Department suggested that with more than one location, cars would become more familiar and park only in the designated spots. The design possibilities, ranging from simple to decorative, can work to keep out cars using minimal street space (see photo B). The fact is that traditional bike lanes are good at making cyclists feel safe and do improve visibility, but they do not protect cyclists adequately from harm from dooring or moving vehicles. Protected bike lanes, on the other hand, do reduce conflicts and stress for cyclists. Such an improvement to the bike lane would benefit all cyclists in and around Cambridge, because improving one road improves connectivity throughout the region. This project benefits car-drivers by removing the potential to open a door into a bike lane, as well as reduced stress from not having bicyclists slipping past a blind side. Studies consistently show—and experience corroborates—that for many people, dangerous road conditions is the reason they don’t bicycle. With all of the environmental and social benefits of bicycling, making it accessible to all comfort levels must be a high priority. A: Aerial view of Ames Street’s protected bike lanes on both sides. B: Minimal extra space required for a safer bicycle lane. I have several co-workers who bike to work every day, and they say the Ames St. bike lanes are the worst, most dangerous part of the journey. The parked cars mean that bikes are invisible to other traffic as they approach the intersection, and with delivery trucks suddenly blocking the bike lanes, bikes can become “hemmed in” suddenly with nowhere to go except into the side of the trucks. It’s really a terrible design. Please make sure that the bike lanes remain plowable for winter!! I’m worried that a design feature like a mini-curb might discourage keeping the lanes clear of snow. Suffice to say that the referenced image only indicates that the greatest number of crashes between motor vehicles and cyclists occurs where there is the greatest number of cyclists. That is what would be expected regardless of facilities and, in itself, does not address the issue of what constitutes the safest design. The most unsafe locations on Mass. Ave. between MIT and Central Square are at several very badly designed intersections. I ride through them practically every day. For example, there are numerous locations where the bike lane is striped in such a way that it encourages cyclists to pass to the right of right-turning vehicles. That’s intrinsically dangerous and it will only be further encouraged by placing cyclists to the right of parked cars. As for the assertion that “the data on the matter just does not support keeping the shared lane system”, my first question is whether this data specifically looks at streets with many intersections and existing parking or whether it also includes completely separate bike facilities, e.g. the Minuteman Bikeway or the Paul Dudley White Bikeway. Nobody is disputing that a rail trail or a parallel path alongside a major highway is safer. The question is what is best for an urban setting with lots of crossings – pedestrians, buses and taxis, loading zones, driveways, and cross streets. While some comments below reveal legitimate trade-offs, the data on the matter just does not support keeping the shared lane system. Click on any of the links provided in the description. Protected bike lanes are overall safer and the clear choice for Cambridge if we wish to encourage more biking. There’s lots of details discussed, but I think these are distractions. The difference of opinion and their consequences are fundamental and simple. As an illustration, it was argued below that “the worst place for a ‘separate bike lane’ would be in a business district…Massachusetts Avenue, in particular, would become completely dysfunctional.” I have exactly the opposite conclusion. I do not believe you can look at the accident map for bikers along Massachusetts Avenue (http://i.imgur.com/jgy2VTR.png) and argue against protected bike lanes because of hypothetical “dysfunction” given the clear safety benefits of separating bikers from cars. Even in the worst scenario of a crowded bike lane, most bikers would prefer to go slower and negotiate with other bikers or pedestrians along these dangerous stretches of road. Why? Because when you disagree with a car on a bike, the car always wins. All practicalities of lane design, weather issues, and biking style aside, this is fundamentally why the two traffic streams should be physically separated for the foreseeable future. Even an imperfect system is better and safer than the alternatives. I hope people support this measure. My daily experience is that when riding near the left edge of a bike lane there is generally plenty of room between a cyclist and a parked car to his or her right. The danger in a bike lane is when a cyclist rides in the middle of that lane or, even worse, toward the right edge and parked cars. That’s one of the things I like about the “sharrows” that the City put down on Broadway not long ago. They are located at, more or less, the safest place for a cyclist to ride – a reasonable distance into the adequately wide lane and away from parked cars. That was really my whole point. Prior to excessive narrowing of the travel lane that generally accompanies the installation of a “cycle track” type of facility, there was usually more than enough of a buffer in the travel lane. It is precisely because the “protected bike lane” is installed that this buffer goes away and makes traveling in the roadway MORE dangerous for cyclists. I could give plenty of examples, but the most obvious one is Vassar Street where I have no choice but to ride as fast as I can in the roadway in order to minimize any interaction with motor vehicles. Some people tell me that I should just use the cycle track, but that is usually just an obstacle course of pedestrians and wrong-way cyclists (as well as turning vehicles, construction areas, temporarily parked vehicles, taxicabs picking up passengers, etc.). I liked Vassar Street so much more before the cyclists were effectively forced onto the sidewalk. We likely all agree with the value of separated bike facilities alog roads where there is a great speed differential; between cyclists and motor vehicles, e.g. Memorial Drive, McGrath-O’Brien Highway, the Jamaicaway, or any highway or twisty-turny road along which drivers drive at excessive speeds. We probably also agree that they make little sense on small neighborhood streets punctuated by stop signs and other measures that regulate speed. However, I would argue that the worst place for a “separate bike lane” would be in a business district where a high degree of crossing pedestrian activity or loading and unloading of vehicles is expected to take place. Massachusetts Avenue, in particular, would become completely dysfunctional, especially in the vicinity of bus stops and loading zones. Thanks for the thoughtful comment. I hadn’t considered the problem of drivers turning right not seeing bikers. How is that dealt with in the U.S. or other countries where there are separated bike lanes and no traffic lights at an intersection? I’m not too concerned about snow removal, as the current in-traffic bike lanes are generally unusable after plowing and bikers and cars have to share the narrowed road. My worry about dooring is that most of the space in the in-traffic bike lanes, as currently marked, is unsafe. There shouldn’t be a marked lane for bikes where most of the lane is actually dangerous to be in. A solution is to have some sort of buffer between parked cars and the bike lane (whether on the left or right of parked cars). You cite a worry about having very little buffer between parked cars and moving vehicles, but if that lack of buffer is dangerous between cars, wouldn’t it be even more dangerous between cars and bikes? As for trash pickup, pedestrians crossing the lane, and the like, I think that gets at appropriate siting of separated bike lanes. I’m assuming these would be sited on bigger roads with businesses and traffic signals and not on small neighborhood streets. The visibility of cyclists in a lane obscured behind a row of parked cars is most definitely an issue when a approaching an intersection with a right-turning vehicle. It’s also a major issue wherever there is a driveway or other access point. A cyclist in the roadway will be much more clearly visible than a cyclist obscured behind parked cars and trucks. As for the “transaction between parked cars and the sidewalk”, this is not simply a matter of passengers exiting and entering the right side of a parked car. This includes cars and trucks loading and unloading, buses picking up and discharging passengers, rubbish and recycling set out at the curb being collected, pedestrians pausing before crossing a street, and more. As for the matter of dooring, a cyclist maintaining a sufficient distance between his or her line of travel and any parked vehicles removes almost all of the risk of being doored. Unfortunately, in some road projects done recently in Cambridge, the travel lanes have been narrowed to the point where a road cyclist often has little choice but to “take the lane” rather than comfortably share it. This is also hazardous for motor vehicle operators trying to park on these streets with very little buffer between the parking lane and moving vehicles. In most locations where a “separated bike lane” might be installed, the only way to do this without completely eliminating parking is to narrow the travel lanes substantially leaving very little buffer between parked cars and moving vehicles. I will add that, unlike the Netherlands, we also have to contend with snow in New England, and the most logical and available place to move the snow is to the curb. Unless you intend to truck away all of the snow, which is often expensive and impractical, it is quite likely that the “separated bike lane” will become unusable during winter conditions. I understand that some bikers are worried about getting stuck behind a slow biker in a separated bike line. I suppose there is a trade-off there, although many of those faster bikers are going so fast they can safely move with the flow of car traffic. In the end, if we really want more people to choose the bicycle, we’re going to have to make the journey safer. Separated bike lanes are a big part of that. I’m having a hard time believing this can be done “citywide” for $50,000. Compare to option #10, which just aims to add shared lane signage on Mass Ave, with an estimate of $70,000. Anyone able to clear this up? I encourage anyone who bikes, or has friends/loved ones that bike, to vote for this proposal. Bicycle traffic continues to rise in Cambridge (see pdf: http://bit.ly/1LGdbgN), and with that must come changes to protect bikers in our city. 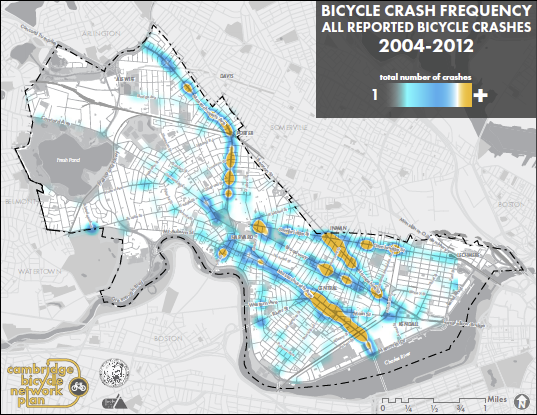 The accident maps should speak for themselves, especially along Mass Ave. and near Inman Square (see pdf: http://bit.ly/1UioR0x). While cosmetic changes can help, repainting lanes and posting signs will not protect bicyclists as effectively as a physical barrier between bikers and car traffic. You may hear philosophical disagreements that cars should learn to respect bikes as equal vehicles, and therefore separate bike lanes are the wrong direction. The day may come where such a situation exists, but currently, it is not a coincidence that places where bikes are common forms of transportation (e.g., The Netherlands, Scandinavia, etc), bicyclists are separated from traffic in some form. In addition to safety, protected lanes make for a less stressful and more comfortable ride (current “comfort levels” for bikers are low in the major arteries: http://bit.ly/1hPeNv7). This will encourage more bikers to join the road, which will in turn encourage a more respectful relationship between cars and bikes on the road. In the meantime, faster or more confident bikers that prefer to bike in the regular lanes are still welcome (and have the legal right) to do so. But the option for a protected ride should be available for everyone. Separate bike lanes can be provided at reasonable cost to the city, and will immediately begin preventing injuries and fatalities of bicyclists. Please vote for protected bike lanes, and send a welcome message to all bikers as they cross the Charles River: Cambridge wants you safe. I don’t support bike lanes wedged between parked cars and the curb. They lack the flexibility for cyclists of different speeds to safely sort themselves out. They also reduce the visibility of cyclists which is perhaps the single most important factor in bicycle safety. The curb at the edge of a street is the most sensible place for the transaction between parked cars and the sidewalk to take place. It is not safe to have cyclists interfering with this transition. I would also like to add that the photo shown and captioned as “avoidable collision in Central Square, with a bicyclist doored in the bike lane” is my photo and I never gave permission to use it – especially to support something with which I strongly disagree. It will be a much better future when we have as many bicycles as there are motor vehicles in the roadway – and not relegated to narrow cattle runs wedged between cars and the curb. I urge people to instead vote for better marked bike lanes in the roadway.